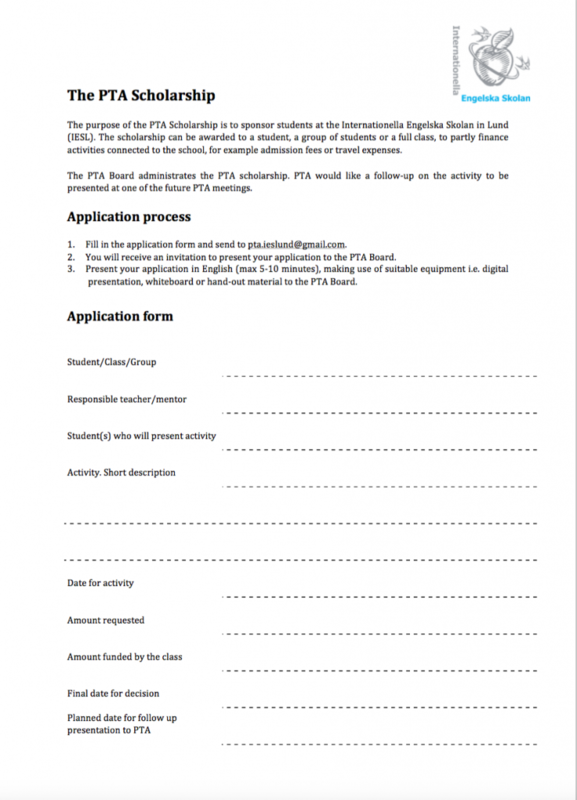 The IES Lund PTA has now launched the ”PTA Scholarship”. This scholarship opens the possibility for students/classes/groups to apply for funds to sponsor an activity that is aimed to build a strong team, enhance education via real life experiences or in other ways further improve school experience. The PTA should not be the sole source for funding. Each student/class/group will have to fund the major part of the activity themselves by either selling products, arranging events or such. They shall also present their application for the PTA board and class representatives at a PTA meeting (held approximately every six weeks at IES Lund). For example, this could be done by 2-3 students using PowerPoint or other media. Also keep in mind that the PTA’s funds are limited and that it is not given that all applications can be granted. The file can be found on SchoolSoft.